Free Photos 4 Soldiers is about giving back to those who sometimes give everything to serve our nation. 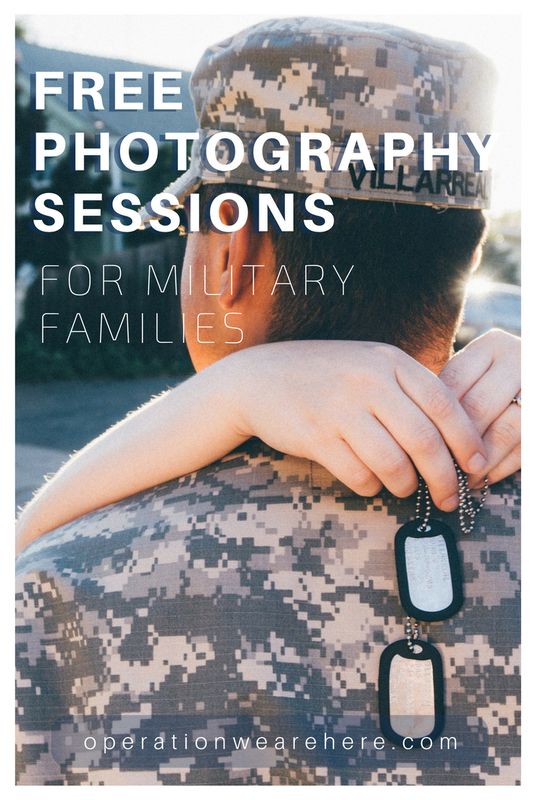 My studio, El Paso Portraits, offers two free photography sessions to any soldier who is deploying to another country and can not take their families with them. After the photo session, I take all of the images and create a touching video set to music. The soldier gets a free 4×6 photo album of their pictures to take with them and their spouse, parent or child can choose a free 8×10 for themselves to keep. For the second photography session, I meet the soldier and family members for their “Welcome Home” ceremony whether that’s a 1 pm or midnight; at the DAACG or the El Paso International Airport. My soldiers have 24 hour access to my service. Or the family can opt to have a second free photography session in civilian clothes in either my studio or at the park. These sessions are provided completely free and there’s never an obligation to purchase anything, although families often do purchase additional portraits. We have a complete line of products including wallets, shaving bags, pillows and other home decor. HeartsApart.org was created to keep families connected while our military men and women are serving abroad. Through the efforts of our community's finest photographers, HeartsApart.org provides our soon to be deployed servicemen and women with pictures of their spouses and children. The photographs are printed on waterproof and durable bi-folded cards, which fit securely in their uniform pocket. HeartsApart.org believes that our military personnel deserve and need the memory of their families to carry them through the difficult times that lie ahead. Founded in North Carolina, home to Pope AFB, Seymour Johnson AFB, Fort Bragg, Camp Lejeune, MCAS Cherry Point and MCAS New River, we have begun our volunteer efforts in our own backyard but hope to organize and mobilize photographers across the country. The last thing on your mind when your wife or husband arrives home after a 4 to 18 month tour, is capturing all this love– on film. Most people are so overwhelmed with emotions they forget to simply point and shoot the camera they are grasping of their child’s first hug, or that single tear of relief from a mother being able to hold her twenty year old son again. With the help of Operation: Love ReUnited and local photographers near your base, you can. If you are a member or family member of the United States Military, and are interested in having very special and touching images with a patriotic edge taken of you and/or your family before a deployment or during, and at your reunion, please contact a photographer in your area now. It’s all made possible by artists wanting to give something back to those who make the United States what it is, and ask for nothing in return- but to come home. The PhotoImaging Manufacturers and Distributors Association (PMDA) and the USO have joined forces to send 10,000 free family portraits to active military families around the globe this holiday season. We've put together a network of photographers who have agreed to donate their time from December 1, 2015 through July 1, 2016 to take a free portrait of families whose loved one has served our country. It's our way of saying thank you to the brave men and women who defend the USA. If your loved one is currently serving overseas, or has returned and you would like to have a free portrait session and receive two free 5x7 photos of your family provided by Shutterfly, click here to find a participating USO bases in your area. When a family member is deployed, a photo can bring comfort to the deployed family member and the family left behind. Project Portrait provides free family portraits to those that have deployment orders which will last for a minimum of 180 days. Project Portrait also provides new baby portraits free of charge to those mothers who deliver while the baby's father is deployed. We are still in the very beginning stages and could use all the help we can get. Please, if you are interested in helping, contact Tawny Campbell. Professional photographers providing free holiday mini sessions for families of deployed service members. We are a network of photographers who donate our time and skills to photograph soldiers homecomings, free of charge. Please visit our website to find a photographer in your area. Yellow Ribbon Photographers is a non-profit organization consisting of member photographers that have donated their talent and time to photographing deploying servicemen and women. Our goal is to provide professional images to soldiers who are about to deploy, so that they may bring along a small piece of home with them. On a case-by-case basis, the loved ones of soldiers who have already left can request a photographer for special occasions (birth of a child, etc.) or as a simple reminder of home.